Tai Chi Chuan (also written as Taijiquan) is an ancient Chinese form of exercise originally created as a fighting art. Tai Chi was accredited to a Taoist Monk named Zhang San Feng as its creator. Its origins date back over 700 years, some say even up to 1500 years. Tai Chi is a type of Qigong (Chi Kung) practiced by millions of people worldwide every day. Qigong in Chinese means energy or breath skill, as Tai Chi when practiced correctly is always practiced using Qigong (breathing, energy) methods. Although Tai Chi was originally a Martial Art it is mainly practiced today as an excellent form of exercise with many health benefits. The words Tai Chi Chuan mean Supreme Ultimate Boxing, used as an exercise for health it would loosely translate as Supreme Ultimate Exercise or Skill. An exercise that utilizes breathing, visualizations and movements to work the entire body all at once. As The Tai Chi Classics say “If one part of the body moves, the entire body moves”. Tai Chi Chuan was created by applying the concept of Tai Chi to very natural movements using relaxation and breathing to generate health, longevity and internal strength and power.The philosophy of TaiChi is simple yet profound, in short, the idea that everything consists of two opposing forces that harmonize with each other to create a whole. Examples : every left has a right, every up has a down, etc..
What Style is The Right Style? 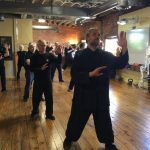 Reading the classics and applying them to your Taijiquan will allow you to progress very quickly, steer you in the direction of correct practice and also allow you to see if what you are being taught is true Tai Chi Boxing. 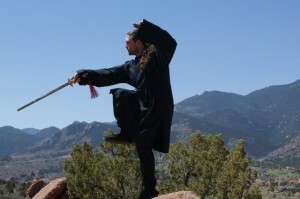 Some very common styles are Wudang, Chen, Yang, Wu, Hao, Zhaobao, Li and Sun Styles. There are others as well. Since little to no historical evidence exists on the creator of Tai Chi Boxing, it’s history is taken from legend. Zhang San Feng of the 13th Century was said to have created Tai Chi Boxing in the Purple Summit Temple on Wudang Mountain. It is said he witnessed a fight between a snake and a crane and this inspired him to create Tai Chi Chuan. This would make Tai Chi Chuan at the least about 700-800 years old. Zhang San Feng taught this fighting art to Taiyi Zhenren, which was passed down to Ma Yun Cheng, then to the “Two Saints” Mi Deng Xia and Guo Ji Yuan. Then passed down to Zhang Song Xi who in turn taught Tai chi Boxing to the Chen Family of Chen village. Though the Chen family maintains that Tai Chi Boxing was created in Chen village. We enjoy having you in class also. His manual is The Insiders’ Guide to Tai Chi. I have trained in different Martial arts now for well above twenty years.